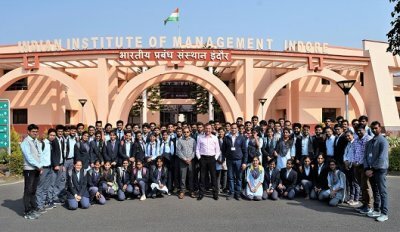 Around 70 participants of the 2nd year engineering (IT stream) from Acropolis Institute of Technology & Research, Indore, visited IIM Indore on February 05, 2019. Accompanied by faculty members, these participants visited the Institute as a part of their study tour to the Institutes of National and International repute to learn about the courses being offered, the infrastructure set up and the various facilities available. The group led by Dr. Dinesh Jain, Associate Professor, Acropolis Institute; started their visit with a group photograph with Professor Himanshu Rai, Director, IIM Indore. Then they visited the Academic Block, Institute’s Learning Centre and Sports Complex as well—to know the infrastructure being offered. They were also screened a short movie on IIM Indore and its alumni, which was much appreciated by the young engineers. The visit concluded with an interaction with Mr. Ajaya Dash, Officer (EPGP), who also coordinated the visit. He briefed them about the various courses offered and the infrastructure details. The students were excited to see the sports facilities available in the sports complex and thoroughly enjoyed their trip to campus.